Firstly, an apology to those who subscribed to get the email version of my posts. I hope you have looked on this site and can see I am still alive. There is a technical problem, which I can’t resolve from here, which means posts are not being emailed. 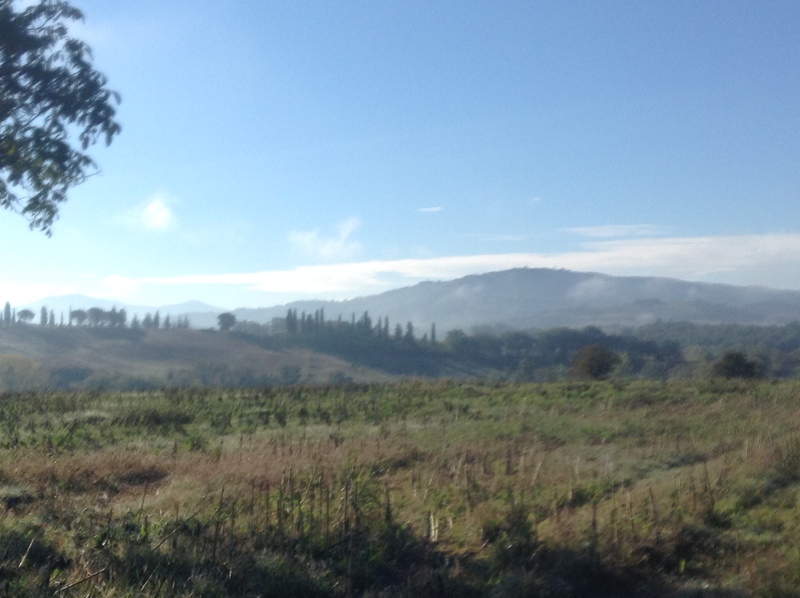 I left Siena on a very cold morning with the smell of rain in the air. Saying goodbye to the night porter of my hotel, I discovered he was an ex-BT engineer from Peterborough. What life story had caused our paths to cross? 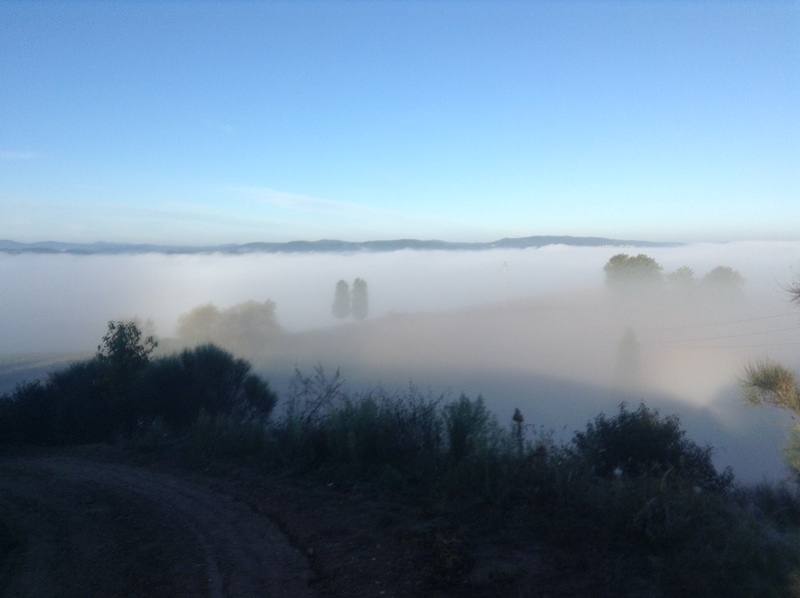 Far off to the south I caught my first glimpse- two and a half days’ walk away – of Radicofani, the hilltop town, the climb to which is often said to be the hardest day of the Italian Via Francigena. 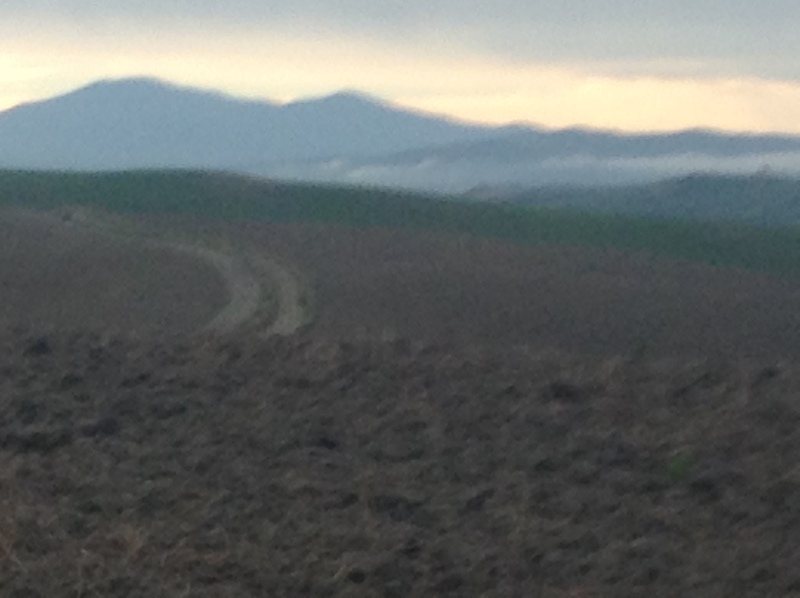 Now, as I walked, the hills were barer, more exposed, sober monotones under a somber sky. The expected rain came, cold and drenching, an hour before I got to the ostello at Ponte d’Arbia. 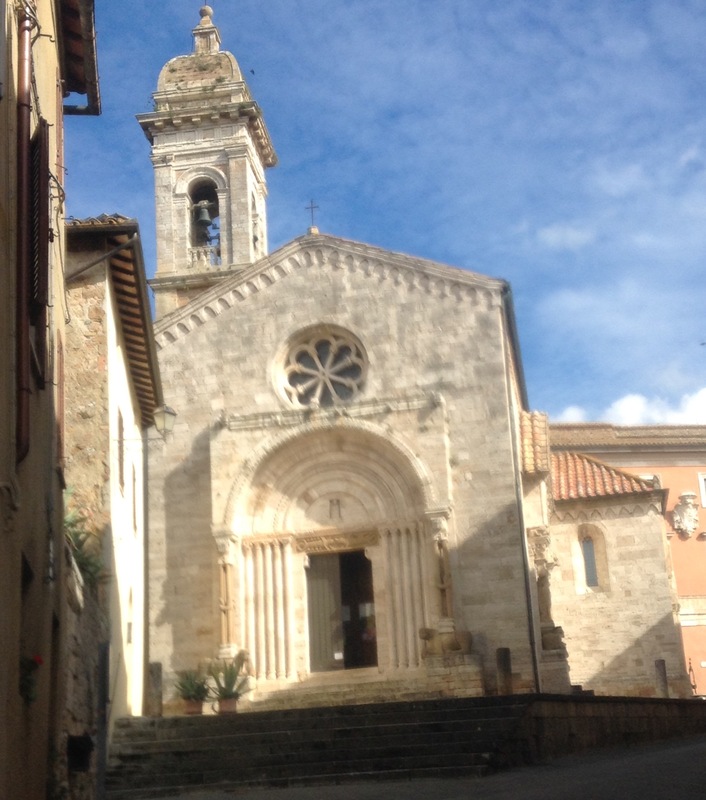 Having looked round the church (lovely Romanesque exterior), I went to a bar to wait. Two American pilgrims (of the sort who have all accommodation booked and their bags carried) invited me to join them in a glass of Prosecco to celebrate a birthday. No doubt the ensuing political discussion was the more heartfelt for it. That evening at supper my ostello companions and I discussed the next day – a 32km stretch of exposed country, mostly steeply uphill, to Radicofani. The forecast was bad. Emboldened by local wine, we sang loudly, “Radicofani! Radicofani! Radicofani!” The rhythm stayed with me the next day. I was to need it. The reader who knows me will immediately grasp the effect of these words. “Oh yes I can.” So…I set about wading across. I kept my shoes on for fear of cutting my feet, but the riverbed was deep mud, and unpleasant. “When you walk through deep waters I am with you.” Finally I was across, but after scrambling up the bank I found I couldn’t get back to the road as my way was blocked by a high wire fence. Finally I found a gap where I could just squeeze underneath. Phew. But then the rain started- drenching pulses in a cold gusting wind. On and on. In sight of the final pull up to Radicofani, wet and cold, there burst upon me a violent thunderstorm, and a deluge so fierce that I was immediately soaked to the skin. Lightning is my greatest fear when walking, and I arrived at the ostello by the church, gibbering with cold, and blubbing with relief. 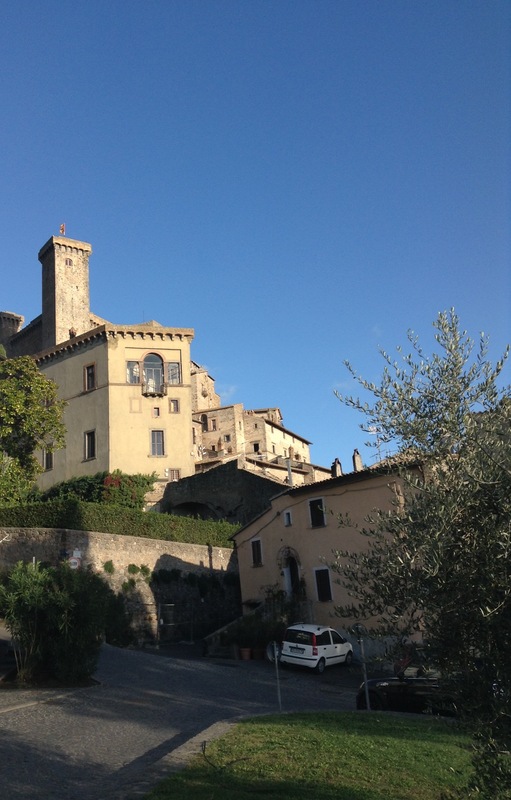 And mirabile dictu the ostello was heated – dry clothes and shoes next morning! “And all (night) long the noise of battle rolled.” The cold air came up against warm weather from the south, and the storms and rain were phenomenal. I was so grateful it was over during the night, and the walk down to Acquapendente, though very humid, hot and sweaty, was free from thunder. Not so that evening – more crashing and banging, and the constant flicker and flash of lightning. 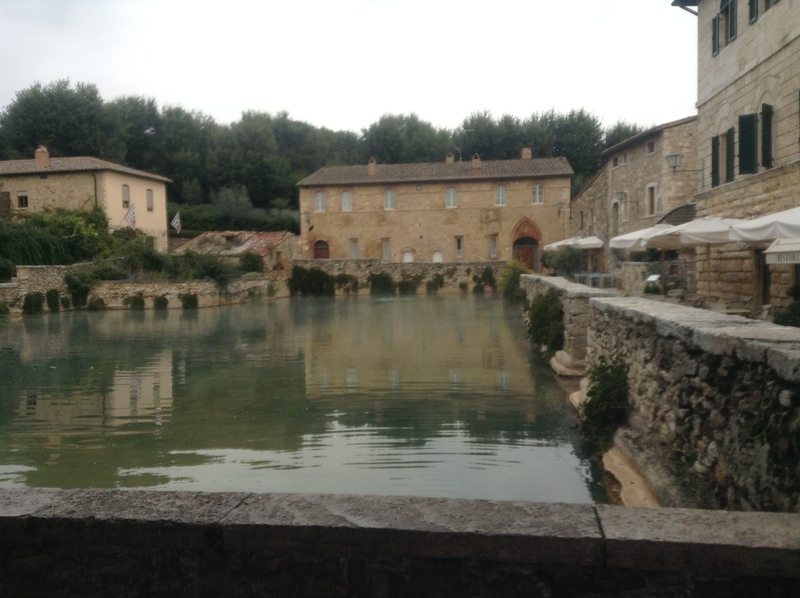 At times the piazza was under water. Sightseeing impossible, I went to the laundrette. Such is the existence of a pilgrim. 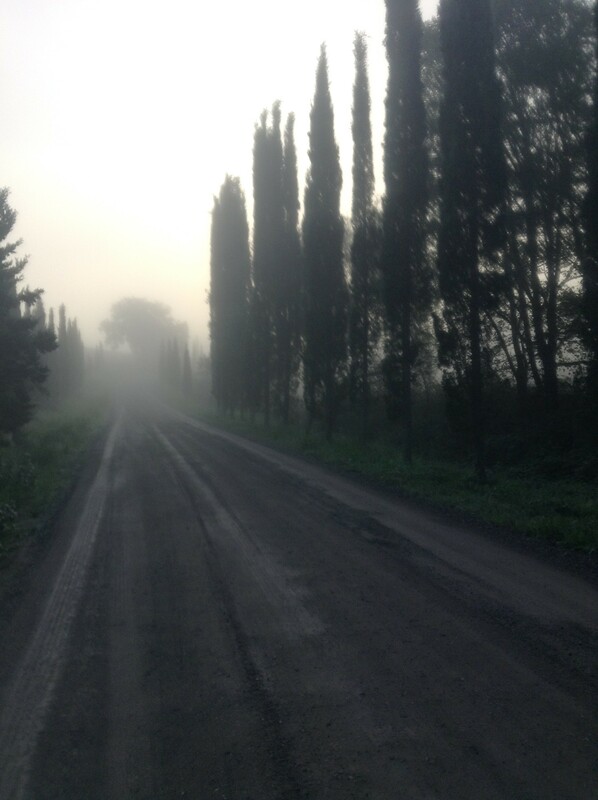 Next morning the world had been washed clean, as had my clothes, but the tracks and paths were deep in mud. 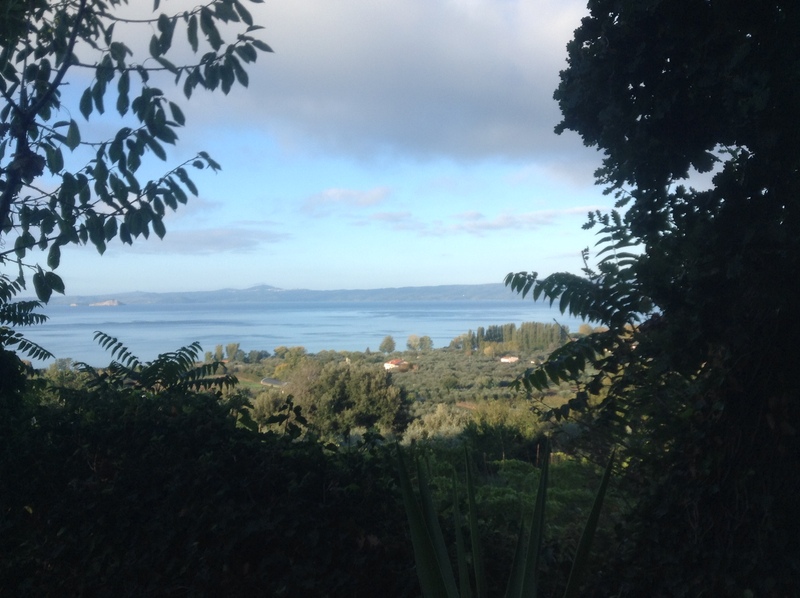 A couple of hours after leaving Acquapendente there is the first glimpse of Lake Bolsena. 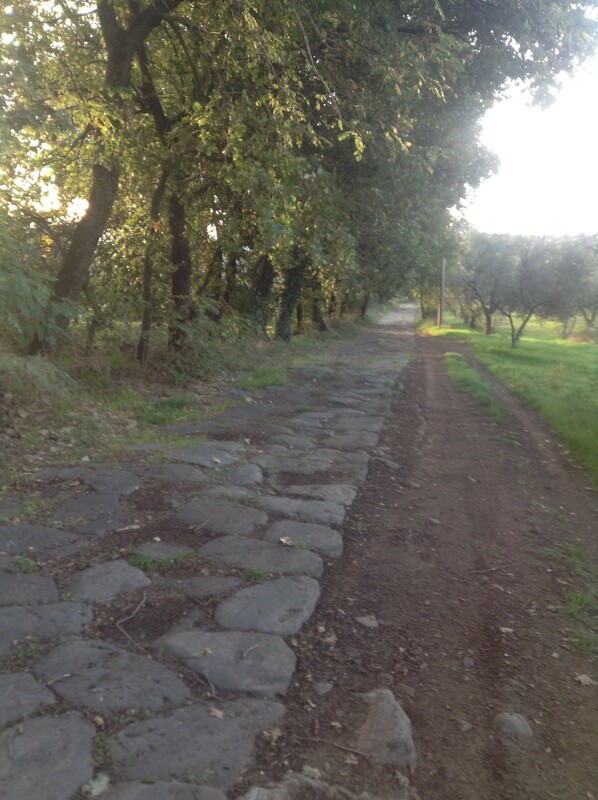 The path leads the pilgrim away from the busy Via Cassia and up into the hills above the lake. It is beautiful, but strenuous, and also surprisingly hot. My face was sunburned. Crazy weather of extremes. The forecast thunder did not come. gives a glimpse of how towns were in the Middle Ages. The tiny narrow streets and old stone buildings admitted no light. The ostello was in one of these. Magnificently restored for the modern pilgrim it had five bathrooms, one for each dormitory. The four of us spread out. But oh! Many had passed this way before, and the mattresses smelled of rancid human grease. 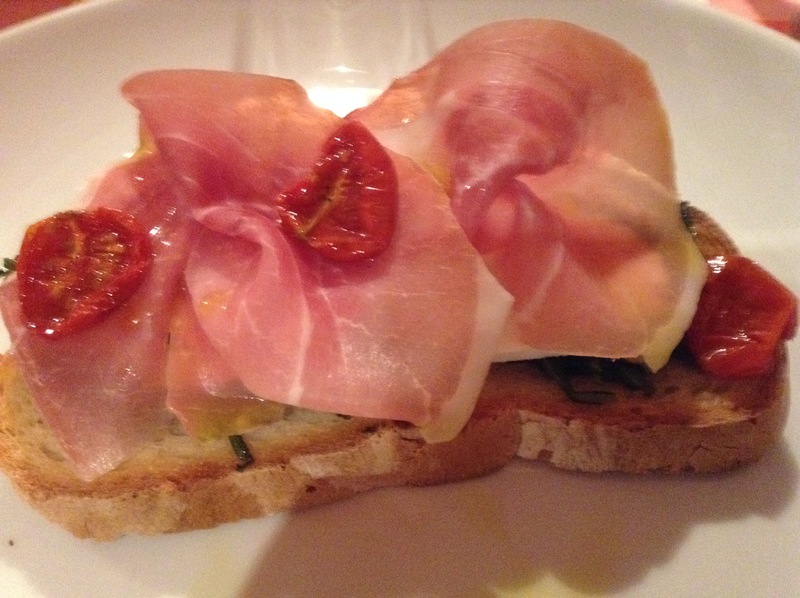 There was some compensation in a meal at the local osteria, served by two rather camp men in jaunty hats. I nearly got a free meal because I was the first pilgrim they had seen who had started at Canterbury, but alas one of my companions let slip I had had a three-month pause in the summer. That night as I slept, my rucksack fell over, dislodging the cap of my water bladder. 1.5 litres of water poured out over the stone floor and seeped under the door into the corridor. Everything I had left on the floor was soaked. Fortunately no-one else was awake when I discovered this, so I fetched a mop and bucket and set to. And to cap it, none of my washing had dried. I put it in the oven for half an hour. It didn’t dry, but was at least warm to put on. 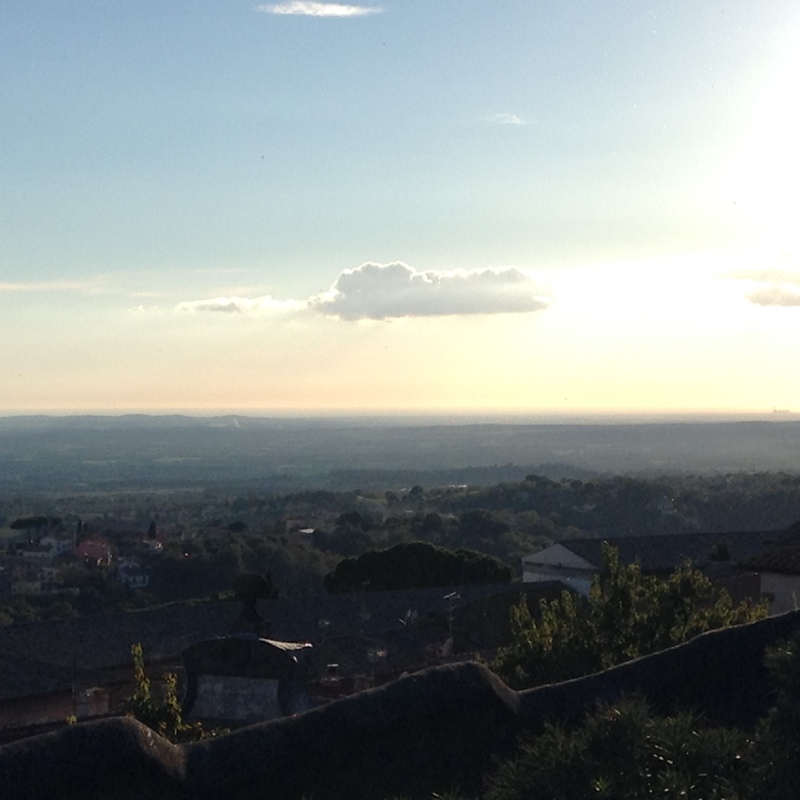 Next day to Montefiascone. I watched a shepherd calling to his distant flock. 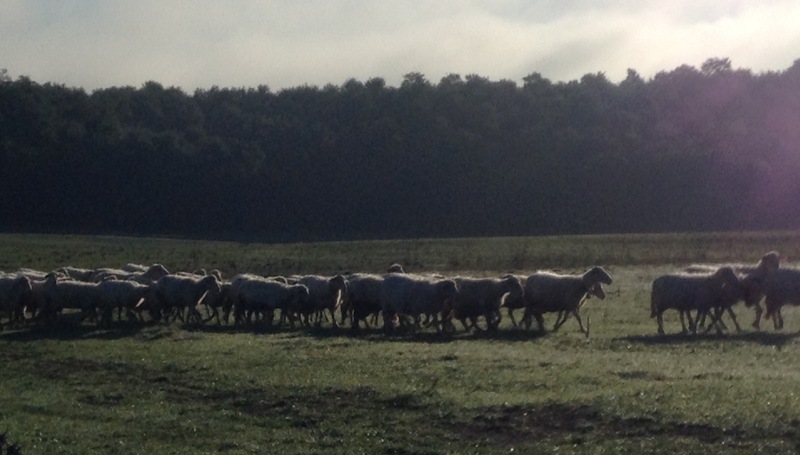 His guard dogs were there to ward off trouble, but their job was not to round up the sheep. These came solely to the shepherd’s voice. I am the Good Shepherd, and my sheep know me. It was a moment to muse on the Gospel, but also I found myself thinking of the great Old Testament diatribe in Ezekiel 34 against the “shepherds of Israel”, the religious leaders of the day, the clericalists, who do not tend their sheep, dress their wounds, or seek out the lost. They are alive today. Another night, another convent. I was lodged (with fellow pilgrim Marco, an Italian blues singer from Switzerland) with the sisters of the Divino Amore. 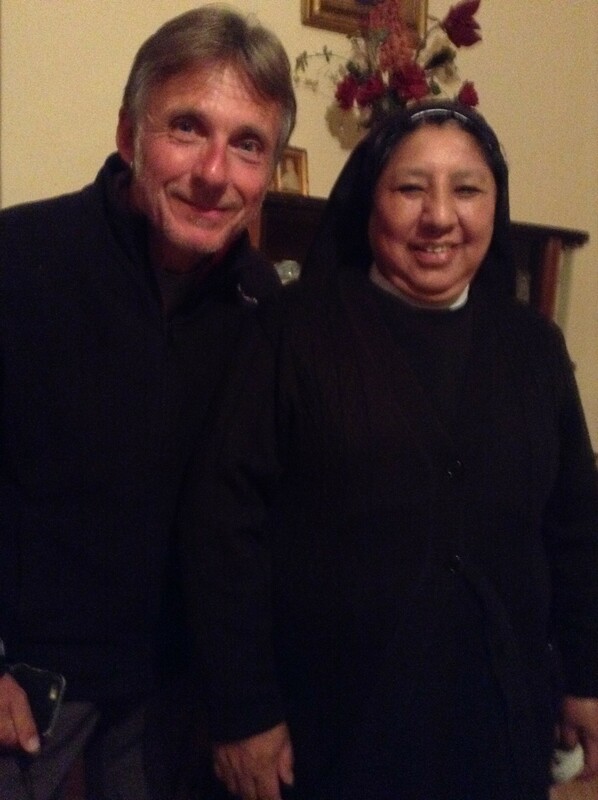 Peruvian Suor Clara told us of a miracle that occurred in the convent, two rooms away from where I slept. 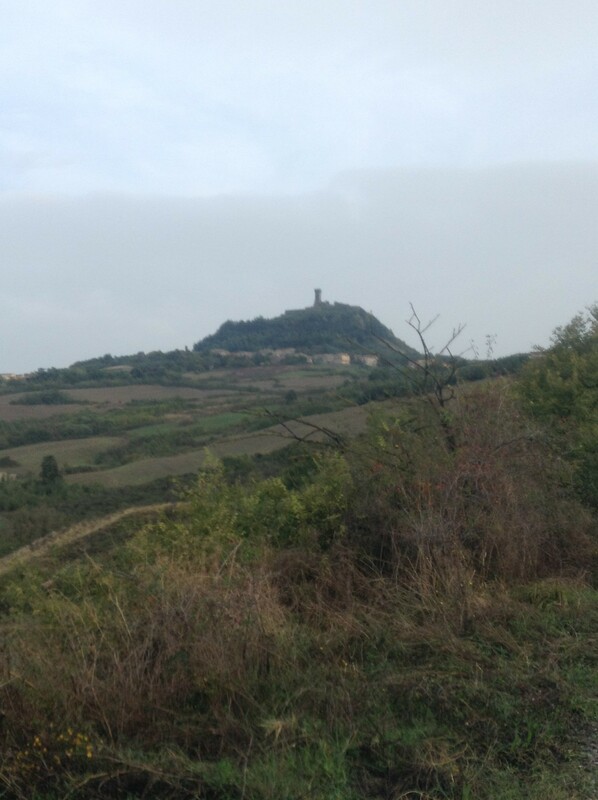 Marco and I climbed the Torre dei Pellegrini, with a 360 degree view: to the west the sea shone in the evening sun; to the east the Apennines; faintly in the north the accursed hill of Radicofani, and to south…invisible and only 100 or so km away – Rome. 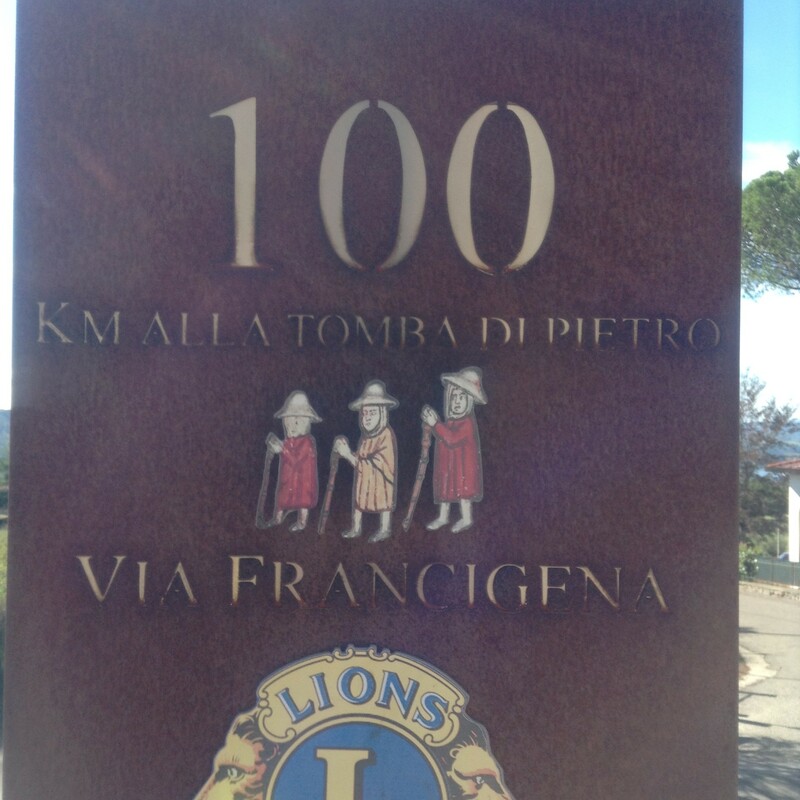 At supper Marco told me about himself: the only son of an ardent Communist, he was only now coming to faith, and this – his first long-distance walk/pilgrimage- was a journey of self-discovery. I came very much to respect him that evening. I discovered next morning that €130 had fallen out of my pocket the evening before. I know where it must have happened. I am very fortunate that I could go to a bancomat and get more. And tonight I am in most un-pilgrim luxury. I have taken a variant from the official VF, which should ensure I get to Rome by Friday- though if I’d known how hilly it was I might have thought better of it. There is no pilgrim accommodation here, so I am in a holiday gîte, a wonderful medieval tower, luxuriously restored. The owner, Luca , has given me fresh eggs, grapes, pomegranates, raspberries from his garden. I have cooked supper, had a glass of wine, my washing is clean. This to the pilgrim is luxury indeed. There is wifi – hence this post. Friday, God willing, Rome? Dare I really hope I shall get there? Missed your emails ,prayed you were ok …and you are. You certainly are being tested with all the mishaps. Mary, how on earth do you find time to walk, take photos, and write posts? I have just read the last one, and find the thought of your imminent arrival in Rome truly exciting! Sounds like ‘Pilgrims Progress’. You seem to have missed the Slough of Despond though! Wow! What a collection of adventures!!!! I’m rooting for you Mary!